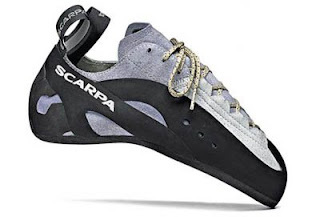 We've teamed up with Scarpa to create some lovely attractive offers for anyone interested in new climbing shoes. If you purchase a new pair of Scarpa rock boots* in the next few weeks you'll receive a FREE Scarpa chalk bag(RRP £15). An excellent offer for everyone but especially for anyone just new to the sport. Also, while we're talking about Scarpa. The excellent Scarpa Sphinx sale continues. These climbing shoes are at a bargain price of £20!!! (RRP £75) The Sphinx is available up to size 41 (UK 7) and is a great shoe for small edges. Find out more information by asking any member of The Climbing Works staff. We've also got a deal on the Scarpa Quest (both Mens & Womens) approach shoe. They're now £60 which is a saving of 20% on the RRP. I can confidently state that these are a great shoe as I'm currently wearing a pair and have done a lot of crag hikes and climbing in them over the last few months.